More than two years after its announcement, Telltale's Fables game starring Bigby Wolf is due out this summer. In 2011, Telltale Games announced that it was working on a video game adaptation of Bill Willingham's excellent Fables comic series, which is published by DC's Vertigo imprint. It was announced alongside The Walking Dead, the episodic adaptation of which was very well received in 2012, while Fables was seemingly put on the back burner. Now that The Walking Dead's first season has wrapped, Telltale Games has finally revealed its plans for Fables. 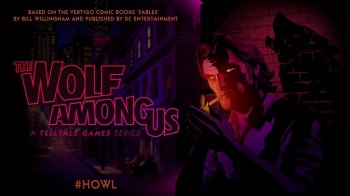 Called The Wolf Among Us, the game takes place in New York City before the start of the comic series, and as fans can probably surmise, feature Bigby Wolf in the leading role. In the Fables universe, fairytale characters are not only real, they're living among us, with many residing in a hidden town in modern-day Manhattan. Exiled from their own worlds, they've set up shop in ours, with some of Fabletown's most prominent members being Snow White, Bigby Wolf, and Prince Charming (actually kind of a sleazeball who married Cinderella, Briar Rose, and Snow White, and also cheated on Snow with her sister). The Wolf Among Us will "further explore the complexity of each and every iconic character in a universe rich with untold history from the darkest sides of the storybooks," Telltale CEO Dan Connors told IGN. "Developing The Wolf Among Us based on the Fables universe has allowed our studio to build upon all of the hallmarks of what makes our episodic series so engaging for players." Among the characters the reformed Big Bad Wolf will encounter are the Three Little Pigs and Mr. Toad, though there's no word on whether any other familiar faces from the books will make appearances. The Wolf Among Us will kick off this summer on the PC, Mac, Xbox 360, and PS3.